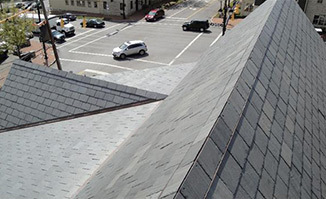 A Slate Roof can last a century, giving excellent long-term value, in contrast to other types of manufactured roofing which must be re-roofed four or five times within this same period. 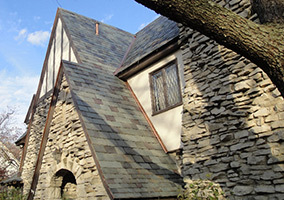 Whether you are looking for a Slate Roof Repair, addition, or a New Slate Roof. With new Vermont slate from companies like Evergreen Slate and Reclaimed Roofs for matching existing roofs with salvaged material. 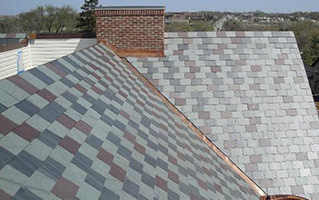 The Slate and Tile Roofing Company does a complete line of Slate Roof Repairs in Columbus Ohio and outside of Columbus. We never use slate hooks or clips in our repairs, Providing you with an Undetectable Slate Roof Repair.